I conducted fieldwork in July, 2010, for the Masters of Indigenous Studies program, I used the money mainly for travel costs to my remote Canadian Sayisi Dene First Nation Reserve called Tadoule Lake. 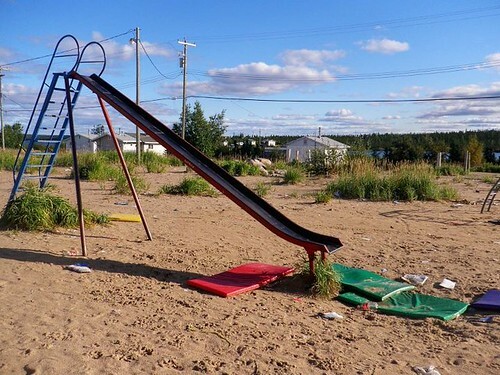 It has about 250 people and is located in northern Manitoba Canada. It is expensive to travel here from Whitehorse, Yukon (where I live now) it was easy to drive the three days east (3000kms or so) to southern Manitoba, but then due to the lack of roads leading to the Reserve (it is fly-in only in summer ice road in winter) the 2 hour return flight added to the costs. It is the most northerly habitation in Manitoba at the moment and happens to be in one of the most sparsely populated areas of the country. My fieldwork focused on in-depth interviews. I made note and observed and attempted to be aware of how things fit together in the community I wanted to gain a better sense of the current situation of the community. Being an “insider” I had to think of myself from a third person standpoint in order to try to see things I might not have focused on if it was a regular visit. I grew up here in the 1990’s and wanted to see how it has changed and what my gut feelings were. My Thesis is on the history of a relocation that occurred in the 1950’s of Sayisi Dene from an inland caribou crossing to the shores of Hudson’s bay (The town of Churchill area) by the Canadian Government. I had to make sense of the history that affected the community and people in a time span of 50 or so years since the initial move. Within that time frame was a very traumatic experience that some would say was like a genocide on the Sayisi Dene, like other well documented forced relocations this one did not go well and was fraught with prejudice and neglect which lead to the destruction of lives. This continued until the mid 1970s when people had had enough and moved back inland to Tadoule Lake. What I’d like to focus on is the history of the fur trade, the Canadian Government’s involvement and the situation of living in a 1950’s to 1970’s Arctic Frontier and military town. How did this history relate to the relocation? Why didn’t people move themselves back to the land initially when things were going badly? Why did the government promise access to better schools and hospitals and modern amenities when at first they put people, not at the developed town of Churchill, 70kms north and left to fend for themselves there at a ecologically marginal location without winter survival gear? Before people completely ran out of food, they had to head into -40C Churchill without a place to live. They were forced into a life of poverty through a scenario of a badly augmented government initiative and injustice. I’m still researching my thesis and hope to complete it by May 2012. 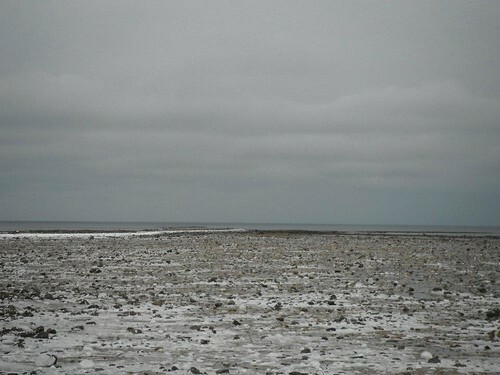 In November 2011 I am in Churchill, with time for further interviews. In the winter of 2011/2012 I will look at Historic video material of in depth interviews conducted in earlier years, originally put together for a documentary film. This material will prove invaluable, many of the people interviewed on tape were elders who have lived through the experiences of Churchill but are no longer with us. I wish to thank the Center for Sami Studies in helping me finanacially; it was essential for enabling my summer 2010 field work, Giitu! Masi Cho. This entry was posted in Master and tagged 2010, Canada, fieldwork, Master's in Indigenous Studies. Bookmark the permalink.